Alas, poor Kevin Hart! Cast out into the wilderness of just being a regular movie star, instead of a movie star with a gig hosting the Oscars—all because he “went on TV every day for what felt like weeks and wasted everyone’s time” after “doing everything he could to appease LGBTQ people without actually apologizing for his homophobic material”—Hart is currently suffering the extreme indignity of co-starring in the No. 1 movie in America. 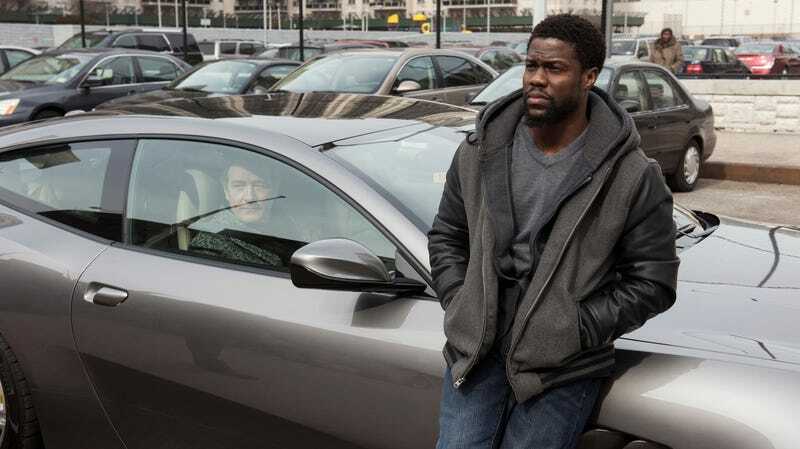 Yes, Kevin Hart has once again proven to be irresistible to the American ticket-buying public, which handed him and co-star Bryan Cranston the No. 1 slot on the domestic box-office charts for their film The Upside this past weekend. Even before Hart’s recent apology-ish tour, The Upside’s road to your local multiplex was an arduous one: Originally scheduled for last March after debuting at the Toronto International Film Festival in 2017, it was pulled from the Weinstein Co.’s release schedule almost one year ago today amid that company’s ongoing, let’s say, troubles. Picked up by STX Entertainment—presumably at a discount—and recut from an R to a PG-13 rating, it’s now STX’s first film to open at No. 1, as Variety reports. Broad appeal was also good to A Dog’s Way Home, the latest in a line of mawkish-yet-morbid dog movies based on the works of W. Bruce Cameron. That film opened at No. 3 with a respectable $11.3 million, sandwiched between Aquaman (No. 2) and Spider-Man: Into The Spider-Verse (No. 4). Buoyed (sorry) by name recognition and—at least in the case of Spider-Verse—euphoric word-of-mouth and awards-season buzz, both films have proven themselves quite resilient, still hanging out in the top five in their fourth and fifth weeks in theaters, respectively. And while Aquaman didn’t win any Golden Globes (and probably won’t win any Oscars, either), it did cross the billion-dollar threshold internationally this past weekend, the first DC comic-book movie to do so since The Dark Knight Rises. Speaking of the Golden Globes, the Oscars’ drunk younger sibling did boost at least one film’s fortunes this past weekend: The Wife, Swedish director Björn Runge’s drama about a literary couple on the verge that prompted a collective cry of “the what now?” when Glenn Close won the Best Actress—Drama award for her performance. Newly re-released in 146 theaters, the film saw a 1,677 percent jump in revenue this past weekend. The Globes’ effects on Best Picture winners Green Book and Bohemian Rhapsody, meanwhile, were negligible; both held steady from last week at No. 15 and No. 11, respectively. And finally, the “astonishingly inept” Keanu Reeves vehicle Replicas opened respectably enough at No. 12 with $2.5 million at the domestic box office, despite distributor Entertainment Studios Motion Pictures’ apparent efforts to keep anyone from knowing it existed. Entertainment Studios Motion Pictures—a name that’s one step removed from just naming your movie company “Movie Company”—also produced last year’s hilariously dumb The Hurricane Heist and just plain awful Friend Request, facts that reduce, but don’t eliminate, our suspicion that it’s actually an elaborate money-laundering front.